A number of traditional Portuguese dishes are based on the unlikely, but flavorful, combination of pork and shellfish. This variation on amêijoas na cataplana, the classic clam and pork stew, calls for three types of pork: fresh pork cubes, spicy sausage, and bacon. The addition of Italian green beans, also known as romano beans, with the clams makes this recipe a one-pot meal. Serve with plenty of bread to sop up the flavorful sauce. Fit a food mill with the medium disk, and set the mill on the rim of a medium bowl. Put the tomatoes with their juices in the food mill and puree. Reverse the crank to extract every bit of flavor from the tomato pulp, and occasionally stop to clean the underside of the mill with a rubber spatula, so the puree falls freely. Discard the pulp left in the strainer. Set the puree aside. In a large, heavy skillet, heat the olive oil over medium heat until hot enough to sizzle a piece of bacon. Add the bacon and cook, stirring, for 5 minutes, or until lightly browned. Add the onion and red and green peppers and sauté, stirring, for 8 minutes, or until the vegetables are wilted and beginning to turn golden. Add the garlic and sauté for 1 minute. Stir in the chouriço and pork and cook, stirring, for 3 minutes, or until lightly browned. Sprinkle with the paprika and cook, stirring, for 1 minute. Add the wine, tomatoes, and parsley and bring to a boil. Decrease the heat to low and cook, uncovered, for 20 minutes, or until liquid is slightly reduced. Spoon half of the sauce into the cataplana; spoon the clams on top and scatter the green beans over the clams. Spoon the remaining sauce on top. Secure the cover in place. Place the cataplana over medium heat and cook for 10 minutes, or until the clams have opened. Bring the cataplana to the table and, using oven mitts, carefully remove the cover. Discard any clams that failed to open. Spoon the clams and rich sauce into warmed shallow bowls and serve at once. Cook the sauce in a Dutch oven or braiser instead of the skillet. 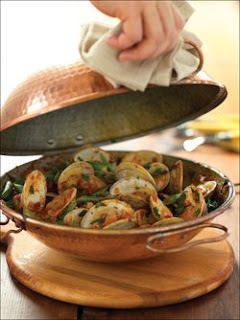 Add the clams, cover, and cook as directed for the cataplana.